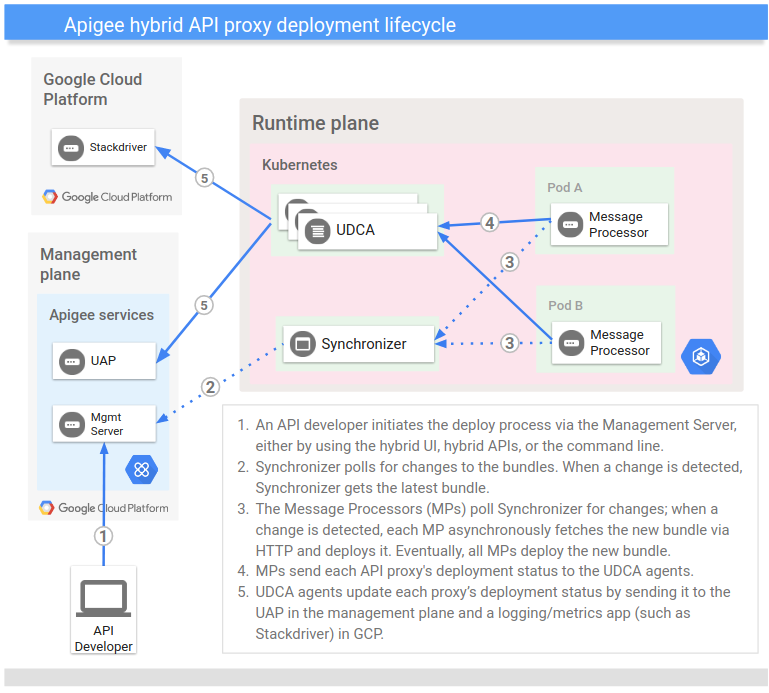 When you make a change to an API proxy, you deploy it to your runtime plane so that the change is propagated across your Message Processors (MPs). You can deploy a new proxy with the Edge UI, the management API, or the command line. In Apigee hybrid, MPs act independently of one another and any given MP can be in a different state than the other MPs (such as active or disabled). MPs poll the cluster's file system to determine when a new API proxy bundle is available. When an MP detects a new bundle is available, it pulls the bundle down from the file system and deploys it. Each MP does this independently of all other MPs in the cluster. This is known as an "eventually consistent deployment model" for API proxies. After you deploy an API proxy, the revision is read-only. You can only change an API proxy if you undeploy it first, or if you create a new revision. You can only deploy a proxy bundle in its entirety. If you make changes to individual fragments or policies, you must deploy the entire proxy bundle.